It’s important to stay safe and be aware of various hunting seasons and activities before going hiking or backpacking. NJ hunting schedules and regulations can be found at the NJ Division of Fish & Wildlife web site and the NY-NJ Trail Conference often posts hunting location and hunting season notices. 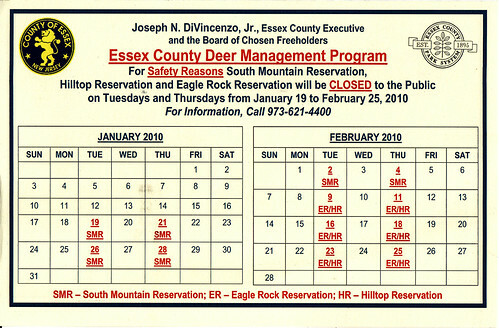 This entry was posted in Local News and tagged eagle rock reservation, Essex County, hilltop reservation, hunting season, safety, south mountain reservation. Bookmark the permalink.